Whether you’re a college student or a retiree, there are many advantages to renting a home rather than purchasing one, and in recent years the United States rental market has seen an increase in demand for apartment and house rentals. In 2016, about 27 percent of Americans rented their home. 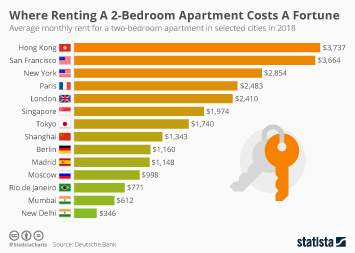 Although renting is seen as an affordable alternative to purchasing a home, renting in major cities has become increasingly expensive, and finding a suitable rental has become a major challenge for many people living and working in major cities. The monthly median asking rent for unfurnished apartments in the United States increased by nearly 50 percent between 2007 and 2017. For many people, this rapid increase in rental rates is an enormous financial burden and there has been a public outcry about how unaffordable living in certain U.S. cities is. In New York, where on average between 39 and 50 percent of household income goes towards rent, a rent increase of even a hundred dollars could be devastating. In the last decade, there has been a downward trend in rental vacancy rates, decreasing from approximately 40 percent in 2009 to just over 26 percent in 2017, reflecting the increasing demand for rental units. This scarcity could partially explain the rapidly increasing rental rates. In addition, a 2016 survey revealed that developers are building fewer and fewer affordable rental units and shifting their attention to building more expensive units. The majority of American renters live in single family homes, followed by structures with five or more units, such as apartment buildings. In 2017, half of the residents of rental properties in the United States were under thirty years old. A recent survey found that among low income renters, 16 percent were not able to pay rent in full for one month in the past three months.